…and I don’t like to lie. So I had a real problem when I would go see my dentist. Recently when I was in for my cleaning, my hygienist told me that there is a new type of brush that can be used in addition to – or even instead of – flossing. (Apparently she saw right through me when I told her I floss nearly every single day!) 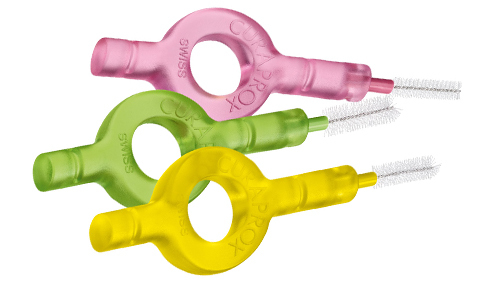 These “interdental” brushes (also called IDBs) are designed to clean the curvatures of the teeth below the gum line – and they are easy to use! But first, you will need to visit your dental professional to be measured. This will ensure that you get the proper size IDB. Additionally, they can make sure you understand the proper technique so that you don’t puncture the gum or harm the enamel between your teeth. But it’s really is as easy as: Hold the brush at an angle, push it in a little, straighten it, push it through. Pull it out, DONE! There are a variety of brushes out on the market. Some have long shafts with more bristles, others are small, or thin, or wide or flat. It’s personal preference once your dental care professional helps suggest the size that fits your particular situation. And know this, you may have a range of different sized gaps between your teeth. If so, you may need a variety of sizes of interdental brushes. You will commonly find that there is one size somewhere in the middle that does the job pretty well. Again, your dental professional can help you to get started. If your teeth are “tight” – meaning there’s very little space between your teeth – IDB’s may not be the best choice for you. Studies have shown that, when combined with toothbrushing, interdental brushes can do a better job than floss at reducing plaque, pockets in the gums and bleeding gums. And, by the way, these brushes are also excellent for those with braces, bridges or implants! Here’s a list to think about if you don’t want to floss anymore! Do use the brushes once day. When? Anytime is good, but since it’s important that you go to sleep without food and plaque in between your teeth., I use mine at night. Saliva (your natural protection) dries up when you go to sleep so having clean teeth overnight makes sense to me!